Unlike most larger firms, we spend the time getting to know our clients and ensuring that we fully understand their goals. We also believe that clients are a critical part of our team. We seek their input throughout the representation. Each client comes to us with different needs and concerns – and we work tirelessly to achieve the client’s individual goals and pursue their objectives vigorously. We limit the number and type of matters we undertake so that we can always deliver the best possible service for the firm’s existing clients. We also pride ourselves as exceptional trial lawyers, and not just “discovery litigators.” Sometimes settling a case is in a client’s best interests – but if the firm is not prepared (or able) to take the case through trial, the client will not achieve the most favorable settlement. Our team approaches each case as if it is headed to trial, and everything we do on a case is designed to prepare our team to persuade a jury. This approach allows us to deliver what our clients expect – the most favorable settlement or a favorable verdict at trial. Our passion and drive to fight for our clients’ best interests is surpassed by none. Our firm has represented a wide range of clients, including licensed professionals, governmental entities, quasi-governmental entities, individuals, partnerships, corporations, and other business entities in high-profile and complex litigation matters. We are committed to providing the highest quality of legal services to you – whether you are an individual, a small business, or a large corporation. Our track record of success showcases our commitment to our clients. The firm’s smaller size avoids the bureaucracy and higher costs often associated with larger law firms. Our size, however, has never prevented us from representing clients in large cases. Rather, our size and approach allows us to provide more individualized service at more reasonable rates. Also, our experience allows us to distinguish what is important at trial and what can be safely ignored. We have the experience to effectively limit discovery. We know what we need to win at trial – and what is just a waste of time and money. We believe communication is critical to the attorney/client relationship. We work hard to ensure that our clients are always fully informed about the status of their case and our agreed-upon plans to resolve it in the most efficient, economical and expeditious fashion possible. 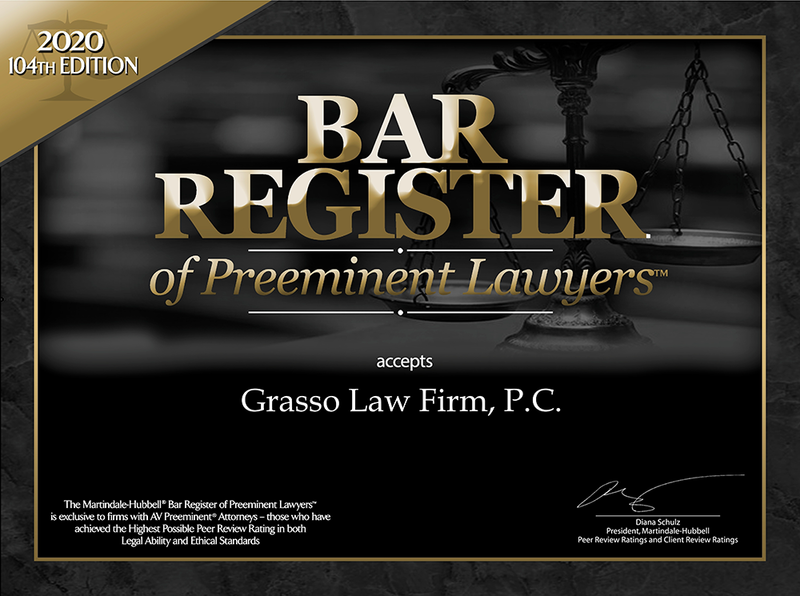 The act of visiting or communicating with the Grasso Law Firm, P.C., via this website or by email does not constitute an attorney-client relationship. Communications from non-clients via this website are not subject to client confidentiality or attorney-client privilege. No contents of this website are to be relied upon as specific legal advice. For legal advice on a specific matter, please consult with an attorney who is knowledgeable and experienced in that area. The lawyers listed in this website practice law only in the jurisdictions where they are admitted. This website is regulated by the Arizona Rules of Professional Conduct.